This is beautiful "Lake Tarpon Villa's" Condominiums. 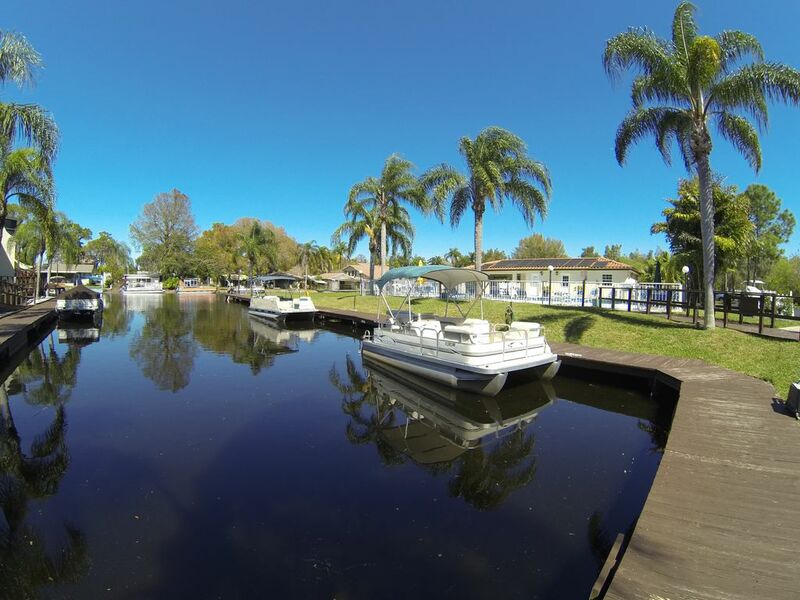 This is a quiet small 40 unit association complex on Lake Tarpon. This fully furnished condominium is located in a lagoon like setting on Lake Tarpon, ten minutes east of some of the most popular sandy white Gulf of Mexico beaches and Sunsets in the nation. This lovely complex is surrounded by water and boardwalks, a notable feature for peace and tranquility! This second floor condominium comes with a heated community pool and a 6 person Jacuzzi. The condo's rear patio overlooks the pool area and boat docks where you have your own private 2006 19-foot pontoon boat awaiting your arrival! The master bedroom is spacious and has an additional attached patio. The second bedroom has a queen bed for family or guests. The family room sofa has a hide-a-bed to sleep two in comfort as well. close to shopping malls, restaurants, and resorts. I hale from Chicago Illinois (1985) and have been in the Military & Law Enforcement field for most of my career. I started a Yacht Management, Transport and Training business in the Tampa Bay area. My wife Karen, in the Insurance field, originated from Tennessee, but has been in Florida since childhood. Karen and I are retired from our career jobs now and want to focus on adding additional condo's and homes to our rental vacation business. Lake Tarpon Villas is unique in many ways. It has the peacefulness of a romantic getaway on Lake Tarpon but it is nestled in one of the most beautiful beach areas in the country. You can fresh water fish out your back door in one of the best bass fishing lakes in the state, or head to the fishing docks in Tarpon Springs and Clearwater Beach where you can hop on a deep sea fishing boat to catch the big ones! You are within driving distance to Busch Gardens, Sea World and Disney World. The city of Tampa is just a drive over the causeway with many venues you would seek in a larger city. Beach life, entertainment and fine dining in the Florida Suncoast. What more could you ask for! Pick sunshine in freshwater or saltwater... It is here for you and your family to enjoy..
Lake Tarpon (2500 Acre fresh water lake) know for its great bass fishing! 1 space provided,, extra parking in rear by the pool. Property & boat were as promised. The boat & lake made our vacation extra relaxing! Condo was stocked conveniently with needed items. The condo location was close to shopping, beaches, putt-putt & many restaurants. We very much enjoyed our stay! We loved it! The condo was very much like home. Enjoyed the pool area and the pontoon. It had everything you would need! Hoping to come back again soon! It was a great winter to spend in the Florida sunshine coming from Minnesota! we had an enjoyable time. the kitchen was well equipped. Beds were comfortable. We enjoyed our stay here. It was a great base to explore the Tampa area, beaches, Dunedin restaurants, and the running trail. The condo was clean and organized. Very convenient to grocery shopping. The owner was accommodating, easy to communicate with, and helpful. Linens and towels were included. The pontoon boat was an excellent bonus to relax during a late afternoon cruise and snack. Stayed 2 weeks in December. The unit was clean, comfortable, well stocked, and everything worked as it should. The pictures were accurate and the owners were excellent. Located on the lake, with dock and centrally located to shopping, area beaches and eateries. Enjoyed our stay and would stay again without hesitation. Thanks Paul and Karen. Thank you for your kind review on our property. We pride ourselves in a clean and comfortable "Home Like" property for our guests to stay. We have many return guests that enjoy our property time and time again. We hope to see you back very soon! Great place, boat, and lake! Three friends and I rented this condo since it was so close to Innisbrook golf resort that we were playing a golf tournament at. Accommodations were great, only downfall was the hard queen mattress. Everything we needed was available at the condo. We loved having the pontoon to take out on the beautiful lake that was easy to navigate. Would recommend!